Garn, virknålar, maskor, mönster, glädje. 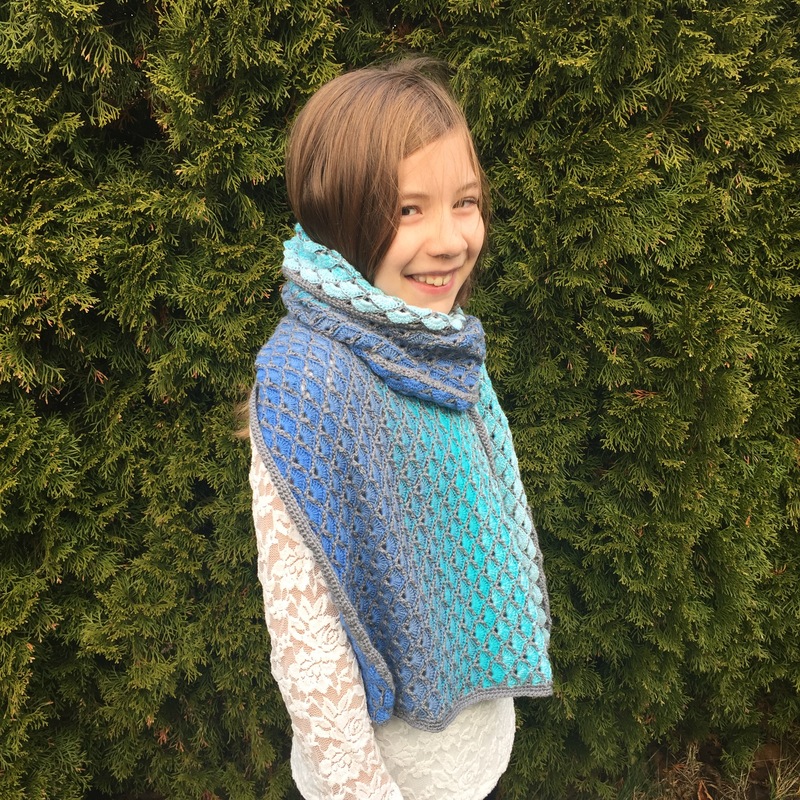 The shawl is made with two different kinds of yarn to create a beautiful effect. You have to cut the yarn after each row to get the row patterns facing the same way. This meens there will be a lot of ends to work away. Wait with doing that until after you added the border since it will give more space to hide the ends. Sc in the second ch from the hook, sc in each ch to the end of the row, cut the yarn, turn. Sc in the first st, * skip 3 sts, 9 dc in next st, skip 3 sts, sc in next st *, repeat from * to * 52 times, cut the yarn, turn. Make a standing dc in the first st, dc in the same st, * ch 5, skip 9 sts, V-st in next st (sc between the dc groups) *, repeat from * to * 51 times, ch 5, skip 9 sts, 2 dc in the last st, cut the yarn, turn. Standing dc in the first st, 4 dc in the same st, * skip next dc, sc around the ch 5 and in the fifth dc in the dc group two rows down, skip next dc, 9 dc in the ch in the V-st *, repeat from * to * 51 times, skip next dc, sc around the ch 5 and in the fifth dc in the dc group two rows down, skip next dc, 5 dc in the last st, cut the yarn, turn. Make a standing sc in the first st, ch 2, skip 4 sts, * V-st in next st, ch 5, skip 9 sts *, repeat from * to * 51 times, V-st, ch 2, skip 4 sts, sc in the last st, cut the yarn, turn. Standing sc in the first st, *skip next st, 9 dc in the ch in the V-st, skip next dc, sc around the ch 5 and into the fifth dc in the dc group two rows down *, repeat from * to * 52 times (the last sc is placed in the last st of the previous row), cut the yarn, turn. Repeat rows 3-7 12 times. 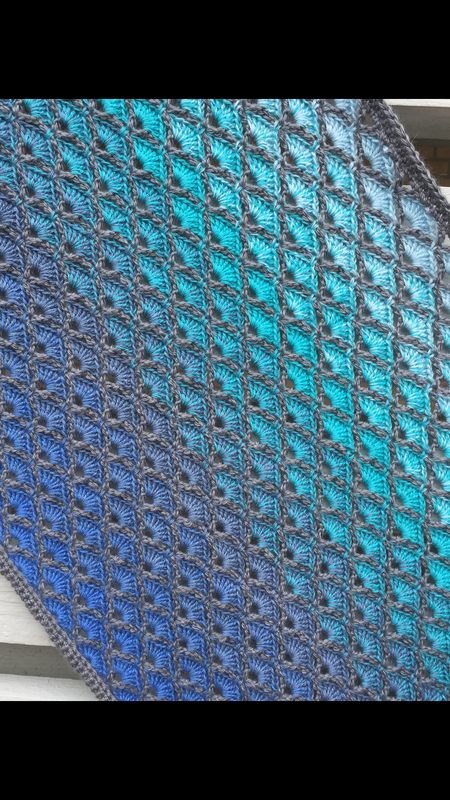 The edging is worked around the whole shawl without changing direction from round to round. The corners are made out of 3 sc. Long top edge: Ch 1, 3 sc in the same st (these creates the corner), sc around ch, sc in dc, * sc around ch, sc in sc, sc around ch, sc in dc, 2 sc in ch 3 space, sc in dc *, repeat from * to * 51 times, sc around ch, sc in sc, sc around ch, sc in dc, sc in ch 2 space, 3 sc in the last st of the row (these creates the corner). Short side 1: 81 sc evenly distributed along the side ( 2 sc per dc and 1 sc per sc). Long bottom side: 3 sc in the first st (these creates the corner), sc in next 2 sts, skip next st, * sc in next 7 sts, skip next st *, repeat from * to * 51 times, sc in next 2 sts, 3 sc in the last st (these creates the corner). Short side 2: Repeat short side 1, close with a ss in the first sc of the round. Ch, sc in the same st, 3 sc in next st (they should be places in the second sc of the corner in round 1, * sc in each st until you reach the next corner, 3 sc *, repeat from * to * twice, sc in each st untill you reach the first sc of the round, close with a ss. Ch, sc in the same st, sc in next st, 3 sc in next st (they should be places in the second sc of the corner in round 1, * sc in each st until you reach the next corner, 3 sc *, repeat from * to * twice, sc in each st untill you reach the first sc of the round, close with a ss. You have now finished crocheting your shawl. Work away the ends. Beautiful!!!! Thank you for sharing!